Before you know it, your teens will be out of the house, living on their own or at the very least, so busy with jobs and social lives that they wouldn’t want or be able to take a vacation with you. That said, traveling with teens can be both a joy and a nightmare. As the well-worn veteran of many travel trips, I know from first-hand experience that traveling with teens has a lot of advantages – and some disadvantages. And like most travel, planning in advance always minimizes stress. 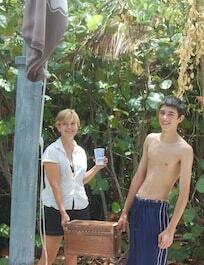 The author and her son, Kenton, on a scavenger hunt. Let everyone in on the planning – I know what you are saying – “We can’t go on five different trips.” And that isn’t what I am saying. What you can do is get some feedback from your teens to see what may be fun for them. Maybe a beach vacation is ideal because your teen daughter can work on her tan and catch up on her chick literature, your boys can fish, swim or surf, and your husband and you can do a bit of everything. 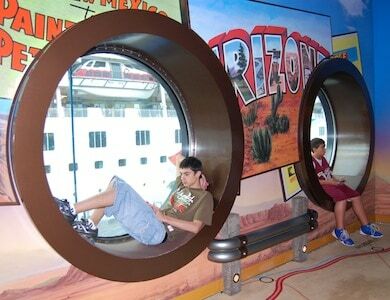 Or maybe a cruise specializing in teen travel would be good. Try to find a location where there is a variety of activities. Take a friend or two. Let’s face it; teens don’t want to spend every waking minute with mom and dad. Allowing them to take a friend on vacation may ease the tension for everyone and have your teens looking forward to the time with the family a bit more than if they were “stuck” with just you. And parents always seem cooler to other kids, which can help your image! That leads to – don’t expect your kids to spend every waking minute with you. Allow them some freedom – within reason, of course. If they don’t want to go to the beach with you for the day and want to spend the day in the air-conditioned mall, is it really that big of a deal? Make compromises. Spend the day with me today, and tomorrow you can sleep until noon. And that leads to – spell out expectations BEFORE the trip. If your teens can’t go to the boardwalk by themselves, let them know now. If you want them to go on the museum tour, let them know now and then let them decide a few activities. Maybe you could let them pick a family activity. This is also a good time to go over curfew, rules, etc. Spell out clearly that behavior not tolerated at home will not be tolerated on vacation. A teen who gets arrested for a DUI or underage in a strange town could be big trouble, particularly if you are off U.S. soil. Let them know that in advance. Don’t forget to go over clothing expectations. If that string bikini and short, shorts aren’t allowed in public, tell your daughter now. That doesn’t mean you can’t have more lenient rules, but if you want them to dress up for dinner one night, it is better to tell them before they pack. The author’s sons, Kenton and Cole, hanging out. What is your budget? If you are only going out to eat one night, let them know. If they have a job and their own money, are they allowed to go out to dinner by themselves? Can they spend whatever they want or is there an allowance? Relax. It is vacation after-all. But let your teens know you are on vacation as well. You don’t want to clean up their dishes in the condo sink because they made a pizza at 2 a.m. Or you don’t want to sweep sand out of the carpet every day because they track it in. Relax again. Chose your battles wisely. Again, allow for compromises and bending of the rules, now and again. Ice cream at dinner one night isn’t going to kill anyone. In fact, it seems like a good idea.